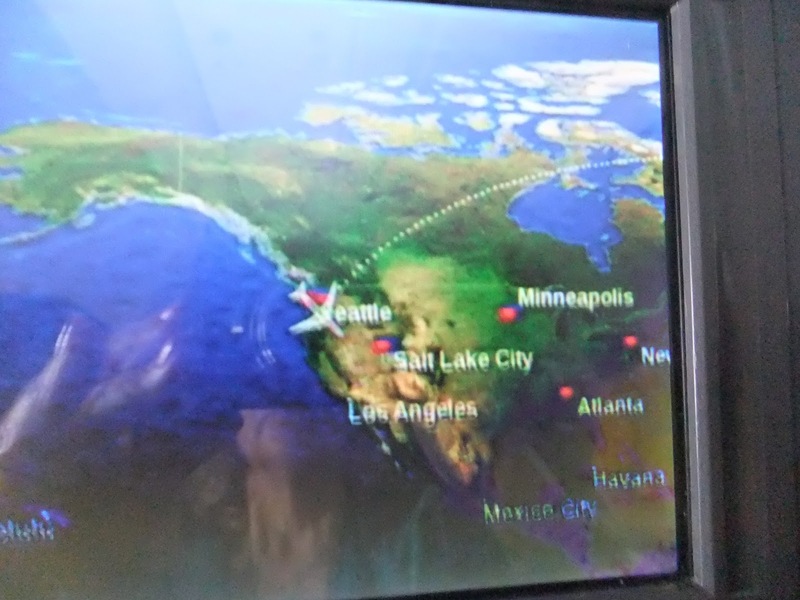 Greece, the birthday gift I’ve chosen for this year has been waiting for me -- a bus, train, three planes, and another bus -- away from our Pacific Northwest home. 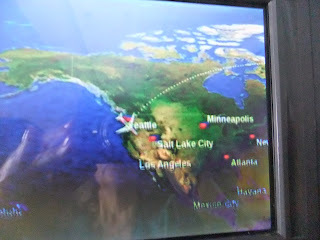 And here I am - time to put the planning into action! 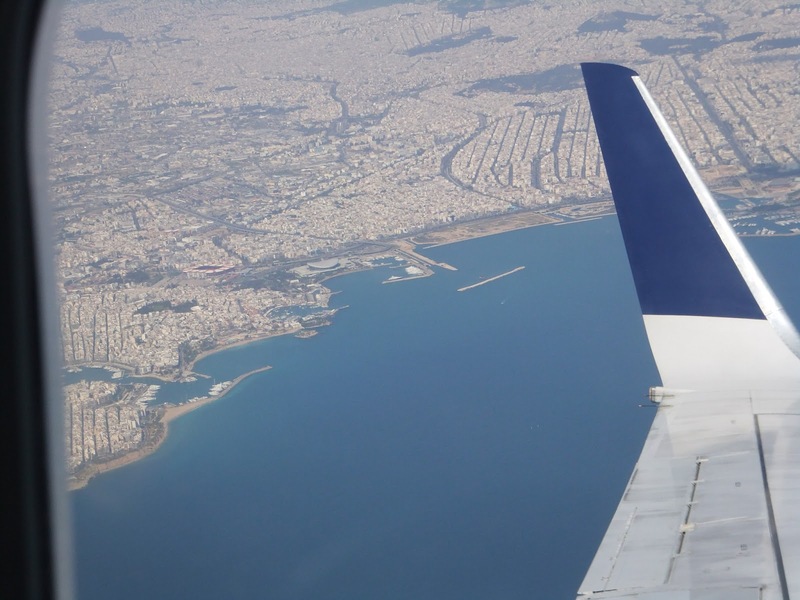 A trip to Greece is one requiring time and distance that can make the youngest of travelers weary: we’ve hurtled some 39,000 – feet above the earth as Delta whisked us some 4,868 miles to Amsterdam. There we boarded another plane for the three hour flight to Athens. 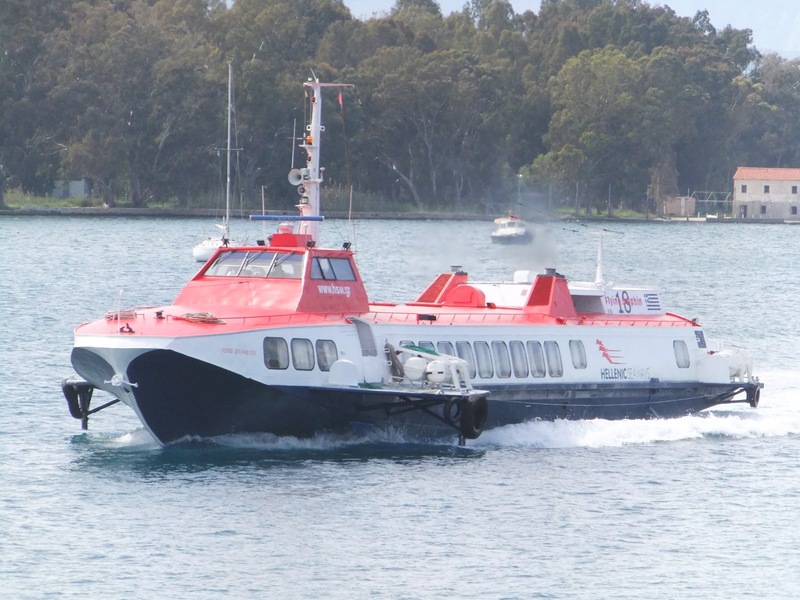 Buses, trains and ferries will all be used on this trip. And I can't tell you the joy in finally looking out the plane's window and seeing Athens below! Total travel time: 24 hours from our front door to check in at our hotel in Piraeus, Athen's port. Through time zones and climate changes we’ve traveled to reach this gift ~ a trip that’s been in the back of our minds since we last visited in 2010. “You must really like Greece,” observed friends who can’t quite get beyond this country’s economic upheaval; one so severe that it has rocked world markets. We know the world has changed – Greece in particular – since we last visited. And we have wondered in what state we will find the country that has wrapped us up in its spell. We wonder whether the charming mom-and-pop places we’ve committed to memory will still be there to welcome us? How will those few folks we remember so fondly be doing? Our trip really is going to be like unwrapping a gift ~ one that I suspect will hold all sorts of surprises. Come along with us as I continue to see what surprises it has for us! 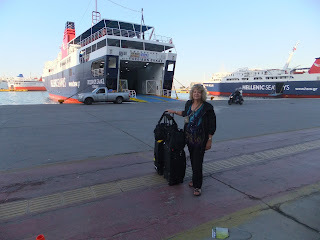 (That's me at the port, waiting for this ferry to take us to Poros. . .more from there soon! And today is Travel Photo Thursday so head over to Budget Travelers Sandbox for more photos and travel. If it's the right trip I'll put up with all sorts of uncomfortable travel. My record was Vancouver to Windhoek in Namibia It took roughly 37 hours so really 24 hours is OK. Fortunately Namibia was one of the best trips I've ever done. I was dragging by 24 hours - I would have been numb at 37! It is as beautiful as we remember it being - maybe moreso! Hope you get to visit the Ionian Sea - beautiful people and places! Thanks for stopping by - we are enjoying the people and the places! I can't wait for the unwrapping as well. Greece is on my list and I'm still not sure why I haven't visited. I look forward to seeing Greece through your eyes until I can see it for myself. Happy Birthday, Jackie! It has been only two full days and we are reminded already how beautiful this country is - both landscapes and people. I do hope you get here one day! 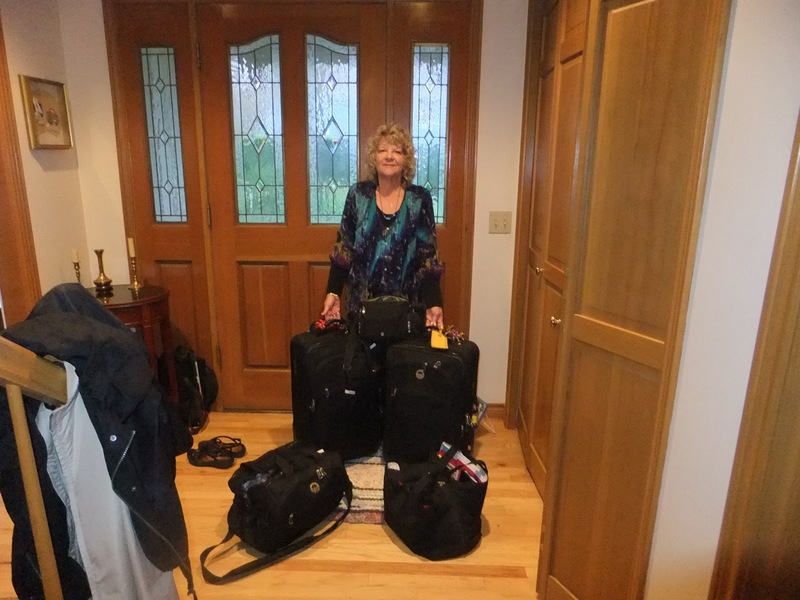 Great to hear that you made it safely. Looking forward to seeing all that beautiful Greek scenery, and reading about all your adventures! The scenery is absolutely stunning - maybe even prettier than we remembered it. As internet access allows I will be showing you the sights. Every thing seems very inexpensive here so we've been leaving money, but it still seems not enough! You do get used to those 24hr trips Jackie...just keep remembering the prize at the end., it makes it all worthwhile! And what a gift that is awaiting you. We're all looking forward to you unwrapping it!! We left on Monday and today is Friday already. . .those fun days always seem to go faster than normal days! Lucky you. I have heard reports that Greece is still as good as ever. You will have a great time. I look forward to seeing the present. It may be even better than ever! The springtime wild flowers, orange blossoms and green everywhere is absolutely spectacular! Yey!!! You made it to your gift!! Looking forward to you future posts as you unwrap more of it. Happy Birthday! Happy Greece time! So far the outer layers have been spectacular! I cannot wait to hear your trip report. Happy Birthday! I hope that Greece is a wonderful as you remember. Arizona: Take a Hike! Or a Walk in the Park . . .